DISCLOSURE: I received a free copy of this book through NetGalley from Simon & Schuster in exchange for an honest review. As I mentioned in passing before (here), my husband’s favorite food is pizza. (As an aside, my favorite food is ice cream. We are quite a pair.) When you’re married to someone who truly loves pizza, you eat a lot of pizza (a couple weekends ago, we had pizza for lunch one day . . . and then went out for pizza at a different spot for dinner that same evening). And, when you eat a lot of pizza, you have no choice but to become a bit of a pizza snob. You can immediately discern good crust from bad crust (and good char from bad char), you know the perfect ratio of sauce and cheese to crust (enough for taste but not so much that the crust gets soggy or the toppings are gloppy), and you know all of the places in town with the best pies (here in Atlanta, that’s Antico, for their Napoletana with broccoli rabe, salsiccia, and bufala mozzarella on a perfectly charred crust). Luckily, there are a lot of people out there that take pizza seriously. They have studied wood-burning oven times and techniques, what cheeses taste best with various toppings, and the exact right amount of sugar to put in the tomato sauce. These days, there are lots of pizza hipsters, and they make some durn good pie. Molly Wizenberg’s husband, Brandon, is one such pizza hipster. And it’s about his pizza obsession, his dream to open a pizza joint in Seattle, and the realization of that dream that Wizenberg writes in Delancey: A Man, a Woman, a Restaurant, a Marriage . The book follows the couple from the hatching of the idea to open their own pizza place through its opening (and beyond), discussing everything from deciding on its name to finding its location to hiring (and, in some cases, firing) its staff to perfecting the pizza dough to crafting the menu. There are emotional highs and lows. There are times they want to quit. There are lots of long days. And, most importantly, there is a lot of talk of delicious food (and not just pizza!). The book is part cookbook; it contains twenty recipes (a sizeable percentage of the 242-page book), from Sriracha-and-Butter Shrimp to Shortbread with Rosemary and Candied Ginger. I’ve made my feelings known about memoirs before. They’re usually a little too feely and poorly written for my taste. But this one is written by a well-known blogger (her blog, Orangette, has been called the best food blog in the world) and writer for Bon Appétit (a magazine I read and cook from religiously), so I had high hopes. The beginning of the book starts out with a strong concept: there is a photograph, followed by a brief introduction and a short chapter that explains the background and circumstances surrounding the photo, followed by a recipe for a dish that was mentioned in the chapter. It all ties together nicely and reads like one of Wizenberg’s well-crafted blog entries or short magazine articles. But, after the first chapter, that structure fizzles out quickly. It seems like Wizenberg lost steam or ran out of good tie-in ideas for the recipes. As the book goes along, the recipes (which follow some, but not all, chapters) become more peripheral to the text . . . and are, on occasion, totally random. This was a disappointment for me, because I really enjoyed the structure of the first chapter. It was well-organized and made sense. And, after starting the book with that structure and then abandoning it, the later chapters seemed a little lazy. The writing has the typical tone of a laid-back memoir. It’s cute but a little scatter-brained (lots of awkward transitions and occasional pointless tangents) and similar in style to her blog. The best moments are her discussions of the struggles and stresses she and her husband endured as a result of working 18-hour days together when they first opened the restaurant. She is very honest in her depictions of herself and her reactions. In her recollections of situations, she allows herself to look unreasonable, unfair, and vulnerable, which is endearing and relatable. A few of the recipes in this book are for dishes that we served at Delancey early on, when I cooked there. But in large part, what you’ll find here are the foods that we wished we were eating. You’ll also find dishes that friends made for us when we were too crazed to cook for ourselves. And you’ll find recipes that we turn to most often now, when we don’t have a lot of time to cook together but still want to make the most of the time we do have. As I mentioned above, I would have preferred more connection between the recipes and the restaurant. As for the quality of the recipes, the only way to assess that is to test them out. And, because this book is, in part, a cookbook, I decided I could not reasonably review the book as a whole without also making and reviewing at least a couple of its recipes. 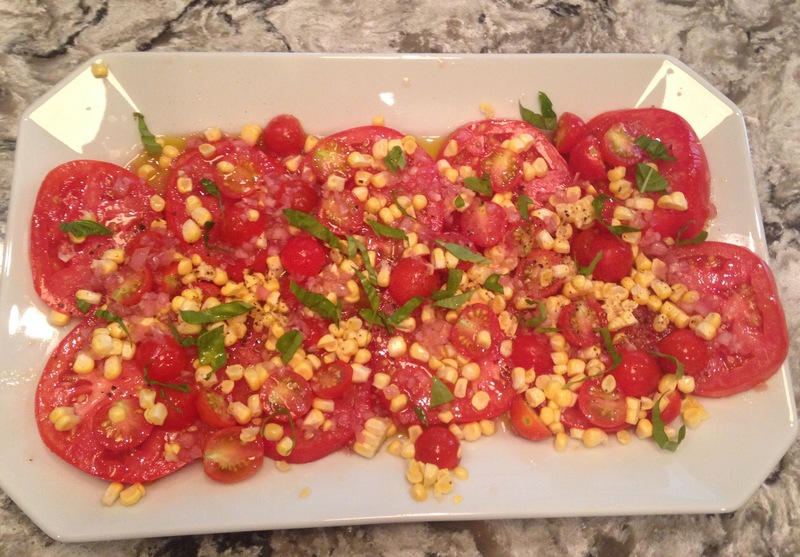 Let’s be honest: it’s hard to go wrong with garden-fresh basil and tomatoes with sweet and crunchy fresh corn kernels. You can’t really mess up fresh and delicious ingredients like those. So, no complaints there. But my husband thought the shallot vinaigrette was a little too shallot-y. The recipe instructs you to “stir together the shallots, garlic, and vinegar in a small bowl” and set them aside for at least an hour to “soften the flavors of the shallot and garlic, so that they no longer taste raw; they should taste lightly pickled.” I set them aside for about four hours, but the shallot flavor was still quite pungent. Edible and pretty tasty, certainly, but a little too strong for his taste. It was good, but I probably wouldn’t make it again. 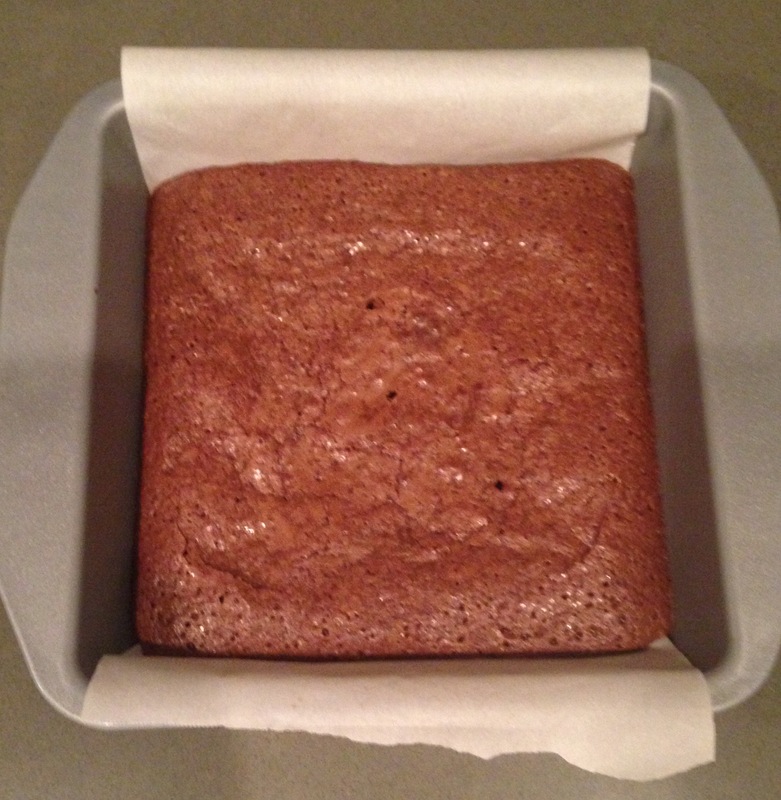 I also made the “My Kate’s Brownies,” which Wizenberg adapted from one of her mother’s old recipes (her mom found it “in an article about Katherine Hepburn in a 1975 issue of The Ladies’ Home Journal”). 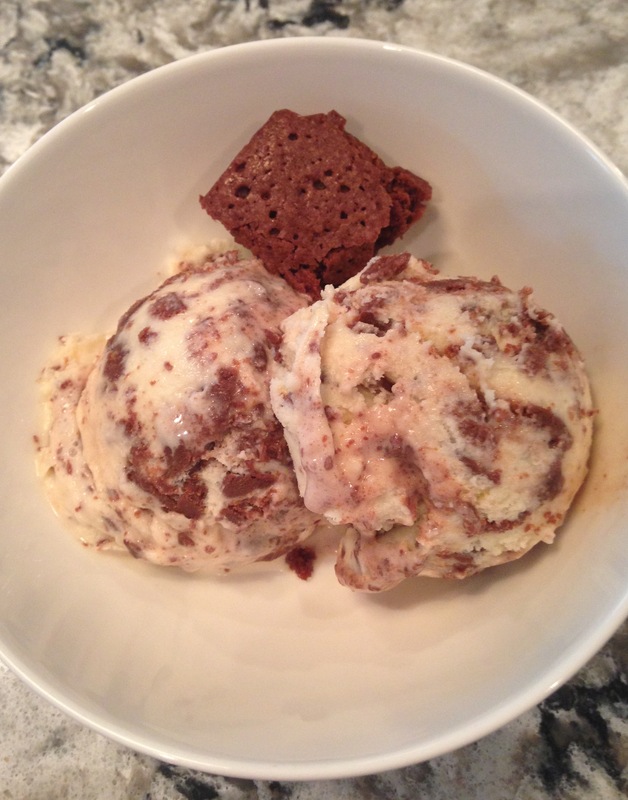 I was looking for a good brownie recipe to use in my latest homemade ice-cream creation (“Nutty Nutella Brownie”—hazelnut ice cream with a Nutella swirl and brownie bits). I wanted a small brownie batch (this makes one eight-inch square pan) with brownies dense enough to hold up well in ice cream. Wizenberg described these as “thin, but they stay chewy and fudgy, and I think they’re perfect,” and, based on the ingredients, they seemed to fit the bill. Plus, this was one of only a few recipes that they actually served in the restaurant, so I thought it would be a good one to make. Like the tomato and corn salad, this recipe was incredibly easy (all told, it took only about 8 minutes of prep time before I popped them in the oven). There are no photographs of the food included in the recipes, so you don’t have that guidepost, but she includes helpful comments like, “The batter will look gritty” to help you along the way. She is obviously writing with inexperienced bakers in mind (“bang the dish straight down on the countertop a couple of times, to release any air bubbles”), which makes the recipes manageable for just about anyone. The recipes are all easy and straightforward (and explained in a very conversational tone, complete with helpful little notes and pointers throughout), and none requires any bizarre ingredients or tools. They’re a nice mix of the totally mundane (Meatloaf) and the unique (Sautéed Dates with Olive Oil and Sea Salt). Any home cook could easily execute any recipe included in the book (but, if you’re a serious home cook, some of the recipes will probably strike you as a little too simple or, in some cases, maybe even pedestrian). Who should read it: Rachel (i.e., people who love to cook and eat great food and who would enjoy the memoir-slash-cookbook concept). This entry was posted in Rating: 3/5 and tagged Book review, Book Reviews, Books, Cookbook, Delancey, Memoir, Molly Wizenberg, NetGalley. Bookmark the permalink. Great review! 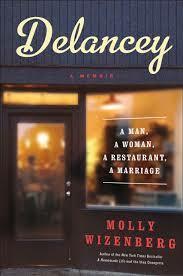 I finished Delancey a few weeks ago. I too am a bit of a pizza snob and have dreamed about opening a pizza restaurant. I went through a roller coaster of emotions while reading, from wanting to open a restaurant to not wanting to opening ever! I’ve never worked in a restaurant before, but my husband has and has always tried to steer me away from this daydream. Now I am happy to just have pizza dinner parties and maybe one day build an outdoor pizza oven. I also wish the recipes in the book were from the restaurant. It would tie in better. I understand her explanation of why she listed the recipes she did, but I think more readers are looking for recipes from Delancey. Thank you for your thoughtful comment! I worked in several restaurants (everything from a sushi place to fine dining) in my younger days, and I loved every minute of it. High energy, fun people, never a dull moment, and the time flies. But I don’t think I would ever want to open a restaurant (and reading this book just reinforced that for me!). Statistically speaking, the chances of success are meager, stress is high, profit margins are low, and the hours are horrible. You’ve got to REALLY want it to sign up for all of that. An ice cream shop, on the other hand . . .